An elderly woman resurrects her long dead husband through hologram technology in Michael Almereyda's Marjorie Prime, a haunting and remarkable meditation on memory and mortality. There's so much to unpack in this thing that it demands more than one viewing, and likely, more than one review. Based on the play by Jordan Harrison, Marjorie Prime allows its characters - the elderly woman, her daughter, and her son-in-law, to relive their memories of their loved ones with a life-like digital approximation that they create by feeding it memories. The memories they give it are usually only the good memories, often which are fabricated in order to build the life they wish they had. It is simultaneously somehow devastating and life affirming, a treatise on the human inability to let go of the past, and our desire to control our own lives through selective memory, it is also a celebration how our loved ones are never truly gone, they live on through our memory. But how accurate are those memories? As Geena Davis' character points out, memories are like "photocopies of photocopies." Jon Hamm (left) and Lois Smith (right) in FilmRise's MARJORIE PRIME. Perhaps the film's most indelible moment comes as one character is busy feeding memories into a hologram. When the hologram questions why she is doing that, she responds simply - "to make you more human." The hologram later turns it around, querying her need to connect with people from her past. Upon hearing her response, the hologram replies - "Ah. You want to be more human too." Marjorie Prime is a heartbreaking exploration of what it means to be human, of what it means to be alive. It's like a more philosophical Eternal Sunshine of the Spotless Mind - beautifully encapsulating humanity at its most vulnerable. What is left of us, when all we have is our memory? What is left of us when memory is all that we are? This is a major film - a powerful and probing work that isn't afraid to ask Big Questions without providing overly sentimental or patronizing answers. 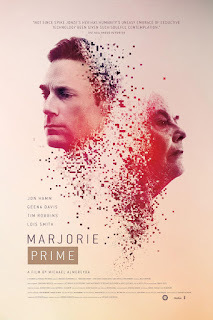 From Almereyda's inquisitive screenplay, to the raw, honest performances by Tim Robbins, Geena Davis, Lois Smith, and Jon Hamm, to Mica Levi's dream-like store, Marjorie Prime is a captivating work that unfolds like wisps of memory, desperately looking to the past for answers, companionship, common experience. What it finds is the beautiful and heartbreaking essence of human life. MARJORIE PRIME | Directed by Michael Almereyda | Stars Tim Robbins, Geena Davis, Lois Smith, Jon Hamm | Not Rated | Now playing in select cities.